For sale: one beautiful, plum-colored McLaren F1. One comedian-owner car. Mostly just driven to the shops. Nearly destroyed only twice, but repaired to perfect condition by the factory. 41,000 miles. Not included: the adoration and love afforded to its original owner, Rowan Atkinson, by the world automotive community. And it's up for a fire-sale price, too. Just £8,000,000, or $11,985,280, under current exchange rates. Yes, it's true. 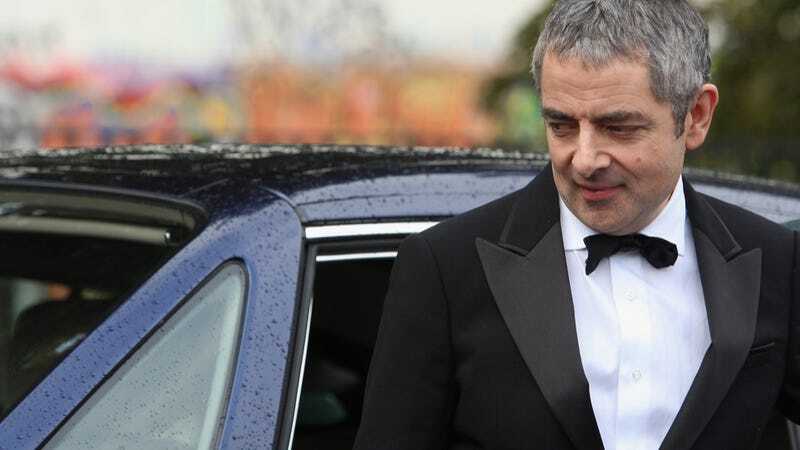 Rowan Atkinson, renowned globally not only for his ownership of a McLaren F1, but also for portrayal of his iconic character, Mr. Bean, is selling the McLaren. He's had it since it was new in 1997, and in that time he's put a staggering amount of daily driving miles on it (for a supercar), but he's also had his share of spills in it. First there was the time he drove straight into the back of a Rover Metro, in 1999, and then there was the time in 2011 when he managed to wrap it around a road sign. Total price of that repair? Just a smooth $1,400,000, paid out by his insurance company, of course. But while we can all sit here and enviously mock him for crashing it, something us super-duper-professional-amazing drivers would definitely never ever never do, the real heart of the matter is that Rowan Atkinson, AKA Mr. Bean, drove the F1 how it should be driven. "What I enjoyed most about it when I first drove it was how lovely it was to drive slowly. To pootle is a pleasure. Of course I've gone to a track and done 200mph in it, but for me it was always the vision of its designer Gordon Murray that made the F1 unique. "Look at a modern supercar of comparable performance and it will be vast, heavy and offer little or no space for your luggage. By comparison the F1 is tiny, yet it will seat three, store enough for you all to go on holiday and still finds space for a proper, normally aspirated 6.1-litre V12 engine. And it weighs the same as a shopping car. Nothing has ever been designed before or since with such imagination and clarity of thought." "It was never bought as an investment," he says. "I bought it for the quality of the thinking that went into its design, and now it has become a thing of value, it is time for it to be enjoyed by someone else." Of course, the most fantastically, absurdly wealthy of Jalopnik readers are screaming at me, personally, to just get to the point already and tell you all about where you can buy it and who's doing the brokering and all that, because that's a service you get with Jalopnik PRO, the service you've never heard about before because it's just that exclusive. So the long and short of it is that it's being sold by luxury London dealership Taylor & Crawley, according to the Western Daily Press. And if that doesn't float your boat, they've also got an Aston Martin DB4GT and a Jaguar XJR-12. But those are only for the peasants.